I’m a planner. Anyone who knows me might laugh at the mildness of this statement. If I don’t have my bags packed a week in advance of any traveling I do, check my temperature. So when it comes to planning ahead for my clients, I am always sure to have my ducks in a row. And speaking of planning, in my book, it’s never too early to begin thinking about next year. Specifically, how to prepare to meet the 2018 Inpatient Quality Reporting (IQR) program requirements. While some hospitals have the IQR program down to a science, there are still many hospitals out there that scramble each year to figure out what the heck they need to do, by what date and who will be responsible for completing each of the requirements. It is especially important to do this now because of the onset of the newly required eCQMs. One of simplest solutions to relieve some portion of this burden is to review the requirements in advance, assess the state of your hospital, and lay out a plan that encompasses which team member(s) will responsible for overseeing each task and what technology you already have in place or what you will require to complete the program. To make it easier for you, I’ve laid out the eight requirements you must do in 2018 to successfully complete the IQR program. Hospitals must report on all six chart-abstracted measures. Hospitals with five or fewer discharges (both Medicare and non-Medicare combined) per measure in a quarter are not required to submit patient-level data. Hospitals are required to enter PC-01 measure data through the web-based tool on a quarterly basis. These data are manually entered. They cannot be transmitted via xml file. If you do not deliver babies at your organization, you must enter zeroes for the PC-01 measure each quarter or you can submit an IPPS Measure Exception Form. Hospitals must submit population and sampling numbers for all chart-abstracted measures. Hospitals must submit aggregate population and sample size counts for each chart-abstracted measure. This requirement only applies to populations for the chart-abstracted measures. It must be completed quarterly through the QualityNet Secure Portal. If you have five or fewer discharges per measure (Medicare and non-Medicare combined) in a quarter you are not required to submit patient-level data for that measure for that quarter. However, you must submit the aggregate population and sample size counts even if the population is zero. Leaving a field blank does not fulfill the requirement. Your EHR must be certified to either the 2014 or 2015 Edition of Certified EHR Technology (CEHRT) or a combination of both. All data must be submitted using the QRDA (Quality Reporting Document Architecture) Category 1 file format. File submission must include one QRDA 1 file per patient, per quarter that includes all episodes of care and the measures associated with the patient file. Hospitals must use the most recent version of the eCQM specifications. Hospitals must use a combination of factors to successfully complete their eCQM requirements. If you have at least five cases in the Initial Patient Population and have no zeros in your denominators for the measures you are submitting, you have successfully met the requirements for submission. If, however, you do not have at least 5 cases in the Initial Patient Population field, you must submit a Case Threshold Exemption. If your measure has zero in the denominator you must submit a Zero Denominator Declaration. By submitting your eCQMs to the IQR program, you will also successfully meet your CQM requirement for the Meaning Use (EHR Incentive) program. If you choose to submit ED-1 and/or ED-2 and/or PC-01 as an eCQM you still must submit the chart-abstracted data as well. Hospitals must report on six HAI measures. All HAI measures, with the exception of the HCP measure, are submitted quarterly to the CDC through the NHSN Portal. For the HCP measure, only data from October 1, 2017 – March 31, 2018 must be submitted by the annual submission deadline of May 15, 2018. Hospitals must report Patient Experience of Care Survey measures data. Hospitals with six or more HCAHPS-eligible discharges in a month must submit the total number of HCAHPS-eligible cases for the month as part of the quarterly survey data submission. Hospitals with five or fewer HCAHPS-eligible discharges in a month are not required to submit the HCAHPS survey for that month. If you have no HCAHPS-eligible discharges in a month, you must submit a zero for that month as a part of the quarterly data submission. Hospitals must report two Structural measures. Data can be entered through the QualityNet Secure Portal from April 1, 2019 – May 15, 2019. Hospitals must complete the Data Accuracy and Completeness Acknowledgment (DACA). The Data Accuracy and Completeness Acknowledgment (DACA) is a requirement for hospitals participating in the IQR program. The DACA is a method of electronically attesting that the data they submitted to the program is accurate and complete to the best of their knowledge. You can attest anytime between April 1 – May 15, 2019. Hospitals may complete the DACA within the QualityNet Secure Portal. and 11 Claims-Based Payment measures. No additional submission is required. Hospitals will receive a score for their performance on 20 Claims-Based Outcome measures and 11 Claims-Based Payment Measures. 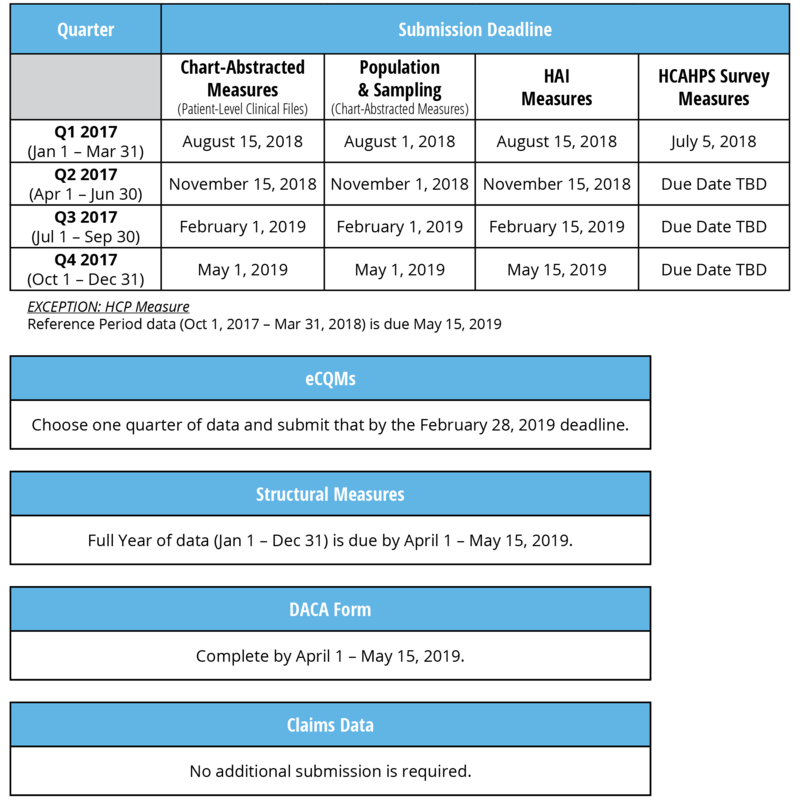 No additional data submission is required to calculate the claims measure rates. CMS uses enrollment data, as well as Part A and Part B claims data, to calculate the measure rates. You will receive a Hospital-Specific Reports (HSRs) from CMS for these Claims-Based measures in the QualityNet Secure Portal. These reports contain discharge-level data, hospital-specific results and state and national results for comparison. There are two types of audits that CMS will perform next year. The chart-abstracted measure audits will continue as they have in the past. Starting in May of 2018, CMS will audit eCQMs from data submitted for the 2017 performance year. They will continue this eCQM audit with the 2018 performance data. CMS performs random and targeted provider audits of hospitals participating in the IQR program. To successfully pass the audit, hospitals must receive a 75% score or better. CMS hasn’t officially released what the audit will look like in 2019, but here is what they plan to do for 2017. If you are audited for your 2017 chart-abstracted submission, it contained data from Q3 2016, Q4 2016, Q1 2017 and Q2 2017. CMS will validate up to eight cases for clinical process of care measures (STK, ED, IMM, VTE or SEP) and up to 10 candidate HAI cases (up to four candidate HAI per template and up to two candidate SSI cases) per quarter per hospital. Each quarter the CDAC will send hospitals a request to submit a patient medical record for each case and candidate case that CMS selected to be audited. 2017 is the first year of data that eCQMs will be audited. CMS will select 200 hospitals to audit via random sample. Eight cases (individual patient-level reports) will be selected from the QRDA 1 files that were submitted. The hospital must then submit at least 75% of sample eCQM medical records within 30 days of the request. The eCQM data submitted must contain sufficient patient-level information including arrival date and time, inpatient admission date and discharge data from the inpatient episode of care. Hospitals who were selected for chart-abstracted audits or hospitals granted an extraordinary circumstances exception will be excluded from the eCQM audit. If you do not successfully complete each of these requirements, you risk losing up to two percent of your Medicare reimbursements in 2020. The same thing applies to your 2019 data. If you don’t successfully complete all elements of the IQR program in 2019, you could lose two percent of your Medicare reimbursement in 2021. Hospitals are facing a significant decrease in funding over time if they don’t fully participate. Much of this burden often falls to Quality. And indeed the Quality department should review and become familiar with all of their data especially eCQM data since it’s so new. Get Quality and IT together to start creating a plan for next year. Look at the list of requirements above and decide on the resources you have (tech and human) to complete the program. Figure out what you will need to be successful and incorporate that into your planning sessions. Unlike, the other measure results of the IQR program, CMS has decided NOT to publish the 2018 or 2019 eCQM data on Hospital Compare, but if we look at the history of quality reporting, it will only be a matter of time until results will be posted there. So, it’s prep time. If you have not already implemented eCQMs in your hospital, there’s no time to lose. It takes time to properly implement. Not to mention how long it can take to educate and improve compliance with workflow changes. If you have implemented the eCQMs already, we suggest that you review your results and identify any gaps in performance. Then create a plan for addressing these gaps before or during 2018. We’ve heard a few statements over the course of the year that go something like this, “I’d rather take the penalty then put forward the expense for getting all of these programs up and running.” We hear you. Medisolv has worked with many hospitals from the very beginning of their quality improvement process. We’ve felt their frustration and understand their concerns. But we can assure you that we can get you through this process and provide long-term support as the regulations and requirements change. Not making a plan is still a plan, but not a sustainable one. Yearly penalty assessments will become steeper and accumulate. Medisolv’s ENCOR Quality Reporting and Management software solution provides hospitals with the tools they need to meet all the CMS IQR reporting requirements. ENCOR is the only endorsed solution for quality reporting and management by the American Hospital Association. In addition to the software, our solution provides your hospital with expert clinical consultants that will guide your hospital through implementation, validation and submission. Unlike other companies, we do the heavy lifting for you when it comes to submission.